We challenge the widespread preoccupation over how agriculture, food, and development should be. Instead, we focus on how everyday experience in agriculture and food is. 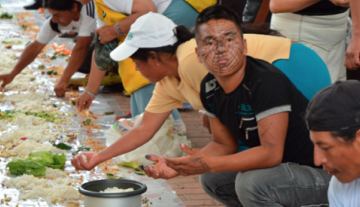 The work of social movements in the Americas leads us to call attention to the forces of change in people’s everyday encounters with food – not as characterised in concept, but rather as embodied in practice. In common food sovereignty discourse, actors are placed in a tidy narrative of oppositions involving marginalised, victimised peasant farmers and helpless consumers facing powerful abstract entities: transnational corporations, the state, science, and out-of-control global food configurations. It is often maintained that processes of food globalisation only can be contained through state regulation. But can national regulations truly allow citizens to set their own agenda for inclusion and for ending political marginalisation? Which part of the nation-state can be trusted to support people’s actions and their values of environmental sustainability, social justice, dignity, and fair income? In fact, through a growth in hybrid public-private partnerships, institutions in Latin America have systematically neglected people’s experiences, while undermining people’s ownership over the public commons. This is happening, for example, through attempts to regulate, in the name of scientifically informed norms of ‘biosafety’ and hygiene, genetic resources, food processing, manure-based fertilizers, and commercial markets. While the state certainly is an influential actor in social change, we find the work of people during their less deliberate, informal moments of their day to be of equal, and even greater, importance. Recently, we met with 23 other researcher-activists working in seven countries of Latin America to exchange and analyse a variety of provocative experiences in food. The resulting casework, assembled in a forthcoming book, is both inspiring and instructive in providing insights into diverse means of existence. 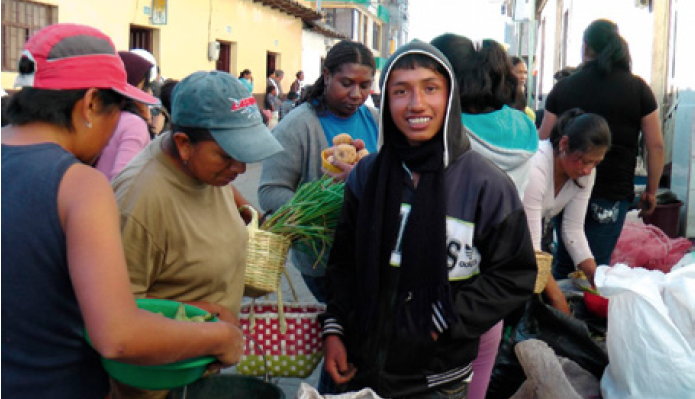 For example: creative building of political clout through increasing citizen investment in agroecology in Ecuador (see box); connecting seemingly disparate people around the flavour and taste of chili in Mexico; and the constituting of healthy, affordable and ‘responsible’ food through an urban-based purchasing cooperative in Valdivia, Chile. As we see in such experiences, people in the street are capable of creating change – a global phenomenon that cannot be explained solely or simply as a form of resistance to ‘the system’. These studies of day-to-day existence in households, fields and on the streets expose how people’s production, procurement and eating are an influential force– be it self-harmful and negative (e.g., overweight/ obesity, exclusion from markets, and degradation of natural resources) or positive (health, equity, and sustainability). The fact that this entrepreneurship happens despite the supposedly overwhelming influences of globalised science and industry calls into question the concern of food sovereignty movements with how to fix and improve government institutions as the necessary pathway to a better future. Other examples of inspiring citizen-led innovation in Latin America include the rescue of underutilised, traditional food sources, such as Andean roots and tubers, grains and leafy vegetables, the rise of heirloom seed production and exchange networks and neighbourhood wholesale purchasing groups, and the culinary activity of food preparation and tasting in kitchens across the region. The tremendous diversity and dynamism of such food practices point at the potential of people’s will, inventiveness and self-organisation. This creativity shows that people are capable of mobilising a wealth of knowledge, assets, values and organisation to advance particular sets of interests. They do this through their daily living and being, with or without clear design or approval from authorities. The change that takes place in people’s lived experiences is often overlooked. One provocative example from research in the Galapagos Islands reveals how family farmers – once the target of criticism from conservationists – effectively block the influx of fresh food from continental Ecuador, which is the primary source of invasive species to the islands. They do this through organic, home-grown and locally marketed foods. These farmers, in fact, protect the environmental integrity of the islands and their valuable tourism industry. The endless examples of sustainable food production, equitable exchange, and responsible consumption in the region and beyond, often in the absence of state-based sanction and sometimes in the midst of heavy antagonism, speak to people’s flair and ability to independently pursue their own agenda. This is why we pose a challenge to the orthodox vision of social change around agriculture and food that prioritises the state and, to a lesser extent, science, as the primary vehicle to institutionalise agroecology and food sovereignty. Instead, we believe that needed change must come from the social, material and political relations generated through practice. Researchers, activists and policy makers often distinguish between jobs and processes (production, circulation, and eating), administrative units (farms, markets, government agencies, cooperatives and organisations) and countries. In everyday food practice, however, such boundaries are blurred, generating ebbs and flows of information, images and properties. Everyday experiences of (ir)responsible production, circulation, and consumption break down the classical boundaries used to categorise society. What is left are people brought together by a shared necessity to eat. Empirical research on how agroecology networks and consumer movements organise and work find that people do not necessarily obey classical boundaries of geography, social status or scientific standards of ‘best practice’. This raises questions over commonly held beliefs about how people self-identify and experience life. In other words, is the world still (if it ever was) primarily assembled around dividing lines such as North-South, rich-poor and urban-rural? In effect, these dichotomies blind the owner to the rich goings-on in food. Studies of changing patterns of nutrition in Northern Ecuador and Mexico, for example, reveal how contemporary food mobilises minds and bodies in endlessly nuanced ways. Meeting one another over a meal, migrating rural families, foreign retirees and well-off nationals in these countries build social relationships and life together regardless of class, nationality or age. Therefore we must identify an agenda of change in agriculture and food that includes renewed scrutiny of daily food practice – in the family, neighbourhood and social networks as well as in the administrative bureaucracies of the state, industry and science. The multiple means of existence found in and enabled through food, reveals a vitality that despite, and even because of seemingly insurmountable forces, provides hope and inspiration for healthier, more equitable, and sustainable futures. The Colectivo Agroecológico, Ecuador’s national agroecology collective, played a central role in influencing Ecuador’s ground-breaking 2008 Constitution, which stipulates a national policy transition from food security (understood as merely meeting people’s basic needs) to food sovereignty (an emancipatory force for democratic change). Among other things, the Constitution says the state must guarantee the free flow of seeds, promote peasant farming and agroecology. Furthermore, it prohibits intellectual property rights on agrobiodiversity and traditional knowledge, as well as the use of GMO crops and seeds. Leaders from the agroecology movement drafted a series of subsequent legislative measures on food sovereignty, including bills for the protection of genetic resources, agrobiodiversity, and the promotion of ecological farming. Nevertheless, little meaningful family-level change has been achieved. In fact, in many ways, the public agenda of food sovereignty is losing ground. For example, in September 2012 President Correa stated this was a “grave mistake” and proposed an amendment to remove this “technological straightjacket” that “jeopardised the country’s food security.” Drawing on sketchy scientific evidence and in the name of advancing the country’s food sovereignty, Correa argued that GMOs would not be the product of some foreign private industry, but rather, they would still be an expression of food sovereignty because they would be “our [Ecuador’s] GMOs” – produced by Ecuadorian scientists in a publicly funded research institute. Other examples relate to the country’s recent land, water and seed laws, all of which of which seek to limit citizen ownership and control of traditional common pool resources, opening the door for privatisation and a deepening of agricultural modernisation. The Colectivo concluded that the logic of modern, industrialised food had become so influential in national politics that it was no longer realistic to expect government officials to represent the public interest, so it decided to place the responsibility for a transition to food sovereignty in people’s hands. 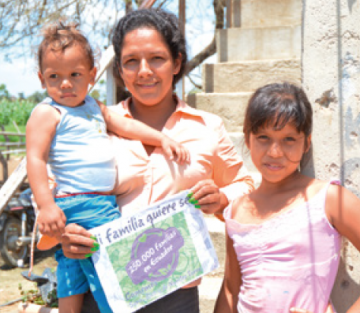 In October 2014 the Colectivo launched its ‘250,000 families!’ campaign, aiming to inspire a critical mass of 5% of Ecuador’s population to join a ‘citizen’s agenda’ of food sovereignty. The Colectivo estimates that the combined purchase of these families in farmer-sold, Andean-based, agroecological food would represent an investment of about US$300 million per year. The campaign finds it not necessary to ‘mould’ or ‘educate’ these 250,000 families to practice responsible consumption, as this untapped resource already exists in the country. Instead, the campaign views its task as helping to identify and connect these families and inspiring them to publicly share experiences. This is being achieved through food fairs, gastronomic events, creative communications and sensorial workshops. The latter consists of innovative and playful tests through which people get reconnected to the flavour, feel, smell and sound of food. This has proven to awaken powerful memories, motivations and desires in them. Two years on, tens of thousands of families from all walks of life have joined the campaign. Once dependent on the politics of the state, a growing number of families are now working together to eat well, healthily and locally, and in direct relation with producers – not just as individual households, but also as a collective, household-, field- and street-level force of vitality and democratic food. Stephen G. Sherwood (ssherwood@ekorural.org) is Researcher of Knowledge, Technology and Innovation at EkoRural (Ecuador) and Wageningen University (the Netherlands). Myriam Paredes is Professor in Rural Territorial Development at the Facultad Latinoamericana de Ciencias Sociales (FLACSO, Ecuador). Myriam and Steve are active in the Colectivo Agroecológico in Ecuador. Alberto Arce is Associate Professor of Sociology of Development and Change at Wageningen University (the Netherlands), and Associate Professor at the Faculty of Agronomy at the Universidad de Chile. Posted on July 20, 2017 by foodgovernancePosted in Agriculture, Food Policy, Food Security, Food Sovereignty, Food StudiesTagged Latin America.